Hospice provides holistic support for individuals living with terminal illness and to their caregivers during the bereavement period. However, some individuals who enroll in hospice services are decertified as they do not experience a decline in health as quickly as required by current regulations, a practice referred to as a live discharge. The interruption in care can affect the physical and psychosocial care needs for individuals and caregivers and leave hospice clinicians with questions about how to best support them. However, there are no formal guidelines to support this process. 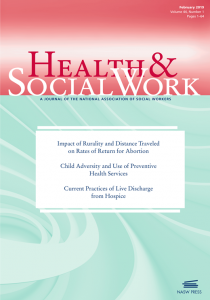 In a recent issue of the journal Health & Social Work, co-published by NASW Press and Oxford University Press, researchers revealed their findings from a qualitative study that explored the current practices of hospice social workers across the United States engaged in the live discharge process. Results from this study emphasized the need to bridge the gaps between policy and practice. Specifically, the results highlighted the challenges hospice social workers face to replicate or supplement the holistic support and unique services hospice provides for individuals discharged alive. Consequently, the authors suggest further research to develop live discharge guidelines to identify appropriate support for patients and their caregivers who no longer meet hospice eligibility requirements.